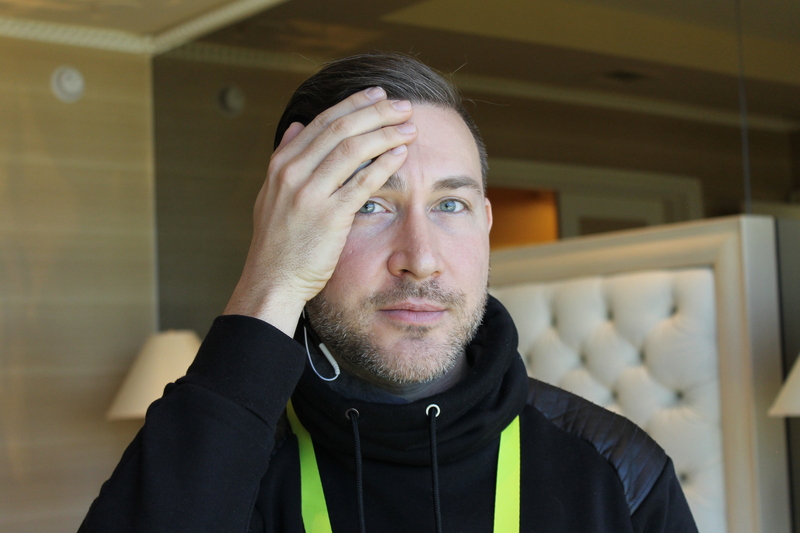 Perhaps the most “shocking” experience (pun intended) I had at CES last week was getting my brain zapped by neurosignaling wearable, Thync. 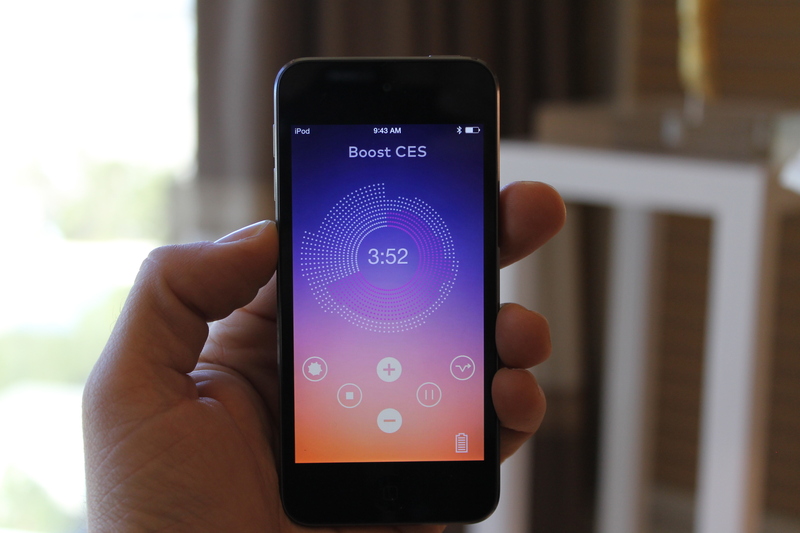 Thync uses electrical stimulation to change your mood. Unlike most other wearables that passively collect data and leave the action up to the user, Thync takes charge (I can’t help myself!) and is an active part of helping you meet a desired goal, which is either to gain a sense of calm or get more energy. I realize that the thought of putting on a device that sounds like it performs electroshock therapy may be terrifying and filled with skepticism — and believe me I felt the same way walking into the company’s suite for the demo. But after thirteen minutes of being zapped, I left the hotel with a noticeable amount of energy — I felt motivated — and no hair singed. Thync is the brainchild of founders Isy Goldwasser and Dr. Jamie Tyler, who were originally looking for ways to use ultrasound to non-invasively target different regions of the brain for healthy alternatives to things like pharmaceuticals, coffee and alcohol. Two and a half years ago they discovered that electrical stimulation was a much faster alternative than ultrasound for achieving their goals, so switched gears to focus on this method. Transcranial direct-current stimulation, or tDCS for short, is not a new thing. If you do a Google Search for tDCS you’ll find many articles and even devices you can buy that claim to do anything from helping you lose weight to zapping yourself smarter. This type of brain stimulation has been used in academia for years, with over 1000 articles being written on its results in the less fifteen years, according to Jonathan Charlesworth, the Senior Scientist at Thync with whom I met. And according to Wikipedia, its origins go way back over 100 years. But as Charlesworth explained to me, most of the methods used so far use a direct flat current, like a beep, whereas Thync’s current, which they have developed over the past couple of years, is more like a song. In addition, advancements in biomaterials and technology, like our smartphones, are making it possible for tDCS to make its way to the masses and really derive results. Thync’s team, of which six of the ten first employees are neuroscience PhDs, worked through multiple trials in a research lab in Boston to pin down what currents (they call them “vibes”) work. After much trial and error, they found that most electrical ranges have a neutral effect while less than one percent had positive effects in terms of calming or energizing the brain. Interestingly enough, Charlesworth told me that they found no current capable of creating negative changes, for example making you less capable of something, so it goes without saying that Thync is only a tool for good despite any dystopian thoughts you might be drifting to. Thync’s wearable device is the size of your thumb and attaches to your temple. (The company wouldn’t let us take photos of the current prototype, and there are none available from Thync directly.) With the plastic device adhered to your temple, the other part to Thync, a biomaterial strip that looks like a flat circuit printed on plastic, is attached to the back of your skull just behind the ear. The company is currently working on making the device more easy to use, friendlier looking and comfortable. The prototype I tried wasn’t entirely scary or uncomfortable but the team’s goal is to make sure that the look or feel of the device is not a barrier or consumer adoption. 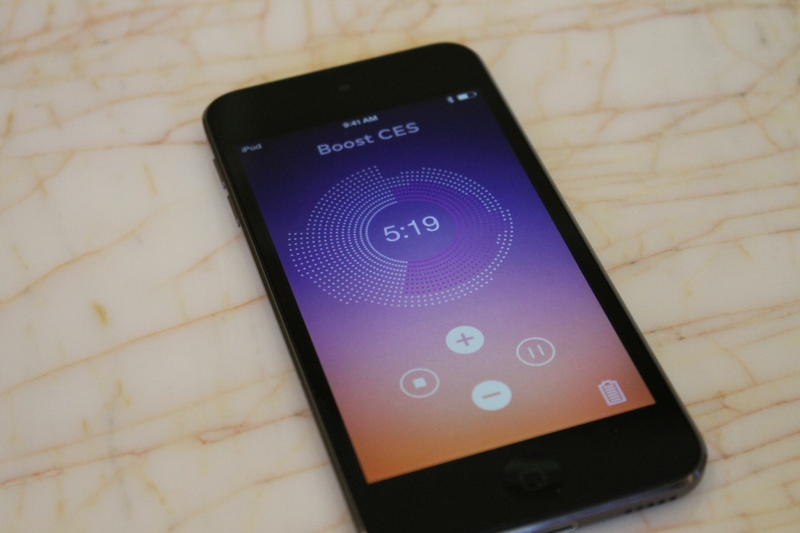 I selected the Energy Vibe session in the iOS Thync app where I was shown a circle of dots surrounding a countdown timer which started at thirteen minutes. In the app, you are able to control the intensity of the current the device is sending to your brain. The dots represent this intensity. I began at 50% and then ramped my way up to 80% by the end of the session. Once in a while, two additional buttons would appear in the app which I was told I could hit to essentially create a quick variation in current intensity, which is supposed to improve results. After about a minute of having the device on my head, I started to feel a tingling sensation both at my temple and behind my ear. As I increased the intensity the tingle sometimes became more of a burn but neither of these feelings caused me any pain. I did get overly ambitious at one point and increased the current so much that I felt my eye twitch a bit. Charlesworth told me that these sensations were all quite normal seeing that the nerves I was stimulating were also responsible for skin sensitivity. He also explained that the physical sensations were much more noticeable the first time you use Thync and that they fade over prolonged use. I can’t say that I felt much change in my energy while I was doing my thirteen-minute boost. Perhaps this was because I was concentrating so hard on observing the physical sensations and understanding the app. But I will tell you that once I took the device off I felt as though a fog had lifted. I was quite alert and, well, energized for the day ahead. This feeling was the same feeling I get when I do yoga or work out. It is not the same type of energy that a coffee or Red Bull gives you, which also means you can’t crash from it either. I carried this feeling for about an hour or two after my session. One of the things that Thync doesn’t do which I wish it did, is quantify any change in my mood. There was no baseline taken before and measurement after my session. Thync relies on you to gauge if your mood has changed. It would be interesting to pair Thync up with something like Sensoree’s GER mood sweater, or other wearables that are starting to play around with Galvanic Skin Response (sensors that measure emotion based on sweat), to see if the end result could be better quantified and less subjective. Thync currently has units with its alpha testers who are using it in their everyday lives. Charlesworth told me that people use the Energy Vibe usually before a workout or when they need energy at work post-lunch when the 3PM nap starts to creep in. He also said this Vibe is being used as a hangover cure which is interesting. For the Calm Vibe, as expected, most people use Thync before bed. I didn’t get a chance to try the Calm Vibe (or more I didn’t want to, since it was 9AM when I met with Thync), but Charlesworth described the feeling from this session as more of “mental deactivation” and “reducing the thoughts in your mind” along with a deep physical relaxation which makes your body heavier. I asked him if its safe to drive after a Calm session, but he advised me not to when they launch the product. But from the tests they have done, there is no impact on cognitive capabilities from a zap of Calm. He further explained that the physical sensations are more that you don’t want to move rather than a feeling of being immobilized. Thync is planning on launching a device later this year. They were not able to talk to pricing or specific dates at this time. I see the biggest hurdle Thync will have when they launch as marketing. A device that sends electrical currents to your brain to change your mind can sound very sci-fi, scary and unreal. Like most wearable tech, this will be a device you’ll have to try for yourself to realize its potential.